Happy Thursday. Are you looking for a yummy treat recipe to make up and share? 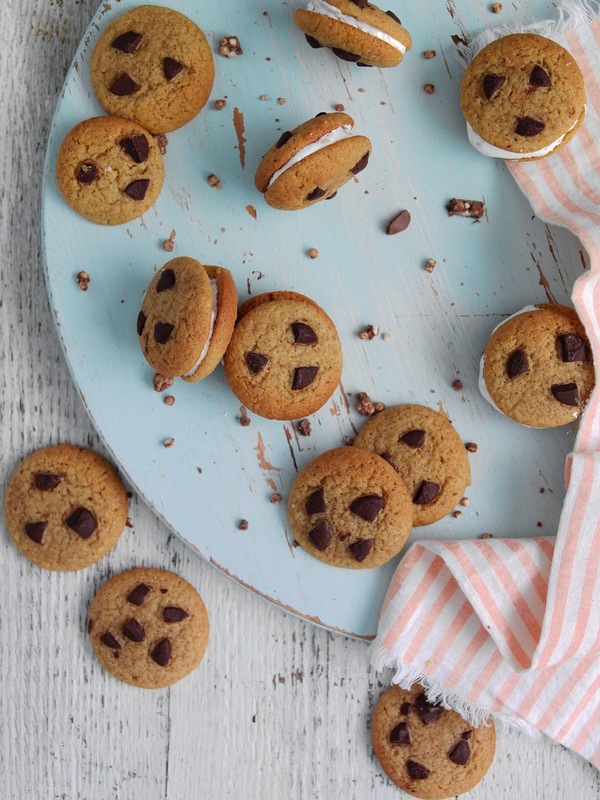 How yummy do these Double Decker Cookie Sandwiches look!? SUITABLE FOR VEGETARIANS : Contains gluten (wheat), milk, nuts, egg, soya. Does NOT contain gelatin or alcohol. Preheat oven to 170 degrees C (150 degrees fan). Line 2 baking trays with parchment paper. For the cookies, cream the butter and sugars together in a stand mixer on medium-high speed or with a hand held mixer, till light and fluffy. Add in the vanilla and egg and whisk till combined. Stir in the flour, baking powder and salt. Mix in 2/3 of the chocolate chops. Shape a teaspoon of dough into a ball (approx. 40 balls of 5g each) and place on baking sheets with two inch gaps between each. Bake for 7 minutes till golden and crisp around the edges and still light in the middle. Leave to cool completely. For the frosting, beat together the butter and sugar on medium-high speed till fluffy. Add in the vanilla, flour and salt and whisk on medium speed. Add in the milk and chopped Double Decker pieces and beat on medium till well combined. Prepare a piping bag with a 1cm round nozzle and fill with the frosting. Pipe a small dollop on the flat side of half of the cookies and sandwich with the other cookies. 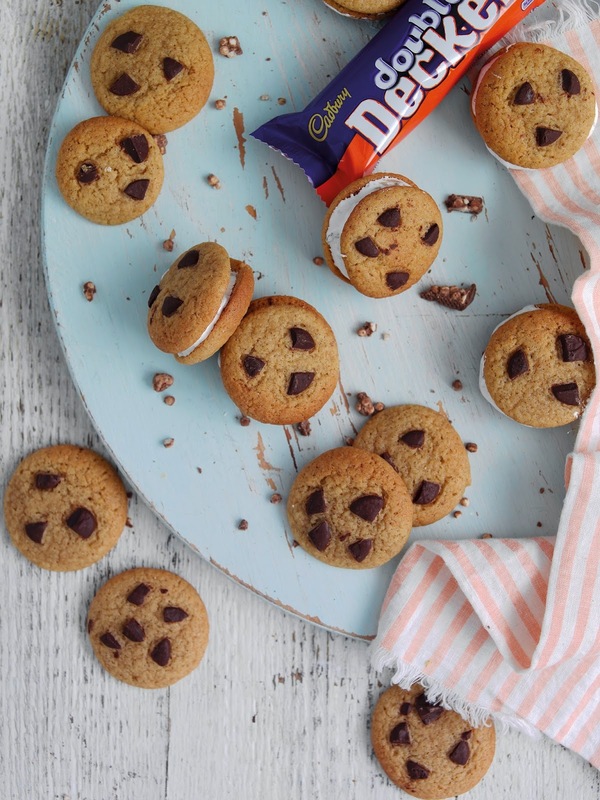 Recipe c/o Cadbury Double Decker. No payment was received. What do you think? Please leave your thoughts below in the comments box. "Famous Faces Launch Latest BBC Children In Need T-Shir"
These look great, and using my favourite Double Decker. Yum. I thought the name related to the two cookies and was intrigued by the actual Double Deckers in them! They look delicious and I shall pass the recipe to a friend and ask her to bake them for me! These look delicious! I'm salivating like Pavloff's dogs here! So uniform too! Mary Berry would be impressed. These look and I bet they taste truly scrumptious! These look absolutely delicious and I want to replicate big time. Thanks for the recipe. I love the look of these cookies. They look very tasty. Wow these look delicious – please send some over via the blogosphere! !